Tostadas soaked briefly in salsa guajillo, layered with chorizo, queso fresco and topped with a sunny side egg, lime crema and a salad of cilantro, pickled onion, avocado and radish. To start we need to make salsa, the most important part. This simple salsa is made with guajillo chile, a mild dried chile with a complex fruity flavor. It is one of the most popular chiles in Mexico for making salsa. If you don’t like your salsa too hot this is a good one for you. It is full of flavor but with less burn. This is a versatile salsa that goes well with many dishes. Remove the stems, seeds, and veins from the chiles. Discard. Chop the cilantro. You can use the stems. Add just enough water to cover the ingredients, about 4 cups. Bring the water to a boil then reduce the heat to low. Simmer for 1 minute then turn off the heat. Allow the ingredients to soak for 15 minutes. The dried chiles will reconstitute in this time. Pour all of the ingredients including the soaking water into the blender. Blend until smooth, about 2 minutes. Add a little water if needed to blend. Strain the mixture back into a bowl. Discard the paste that remains in the strainer. Heat 2 tablespoons of cooking oil in your saucepan over medium heat then add the strained salsa. Simmer the salsa for 30 minutes until it thickens. The salsa will darken in color during this time. Spoon the sauce onto plate with a bit of chorizo and queso fresco, add tostada and drench in salsa, repeat process with second tostada. Top with the last of the chorizo, then the egg. Toss cilantro with marinated onions, radish and avocado, place on top of egg. Drizzle with lime cream for garnish. 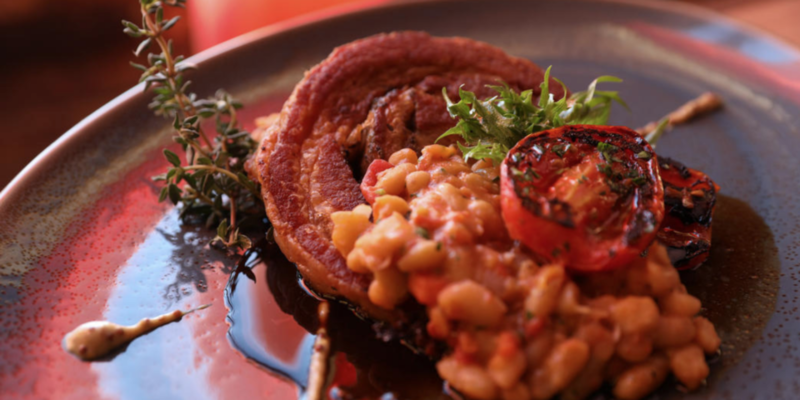 The porchetta is a classy pork and beans, placing rolled pork shoulder on a bed of slow-cooked cannellini beans with tomatoes, carrots and onions. 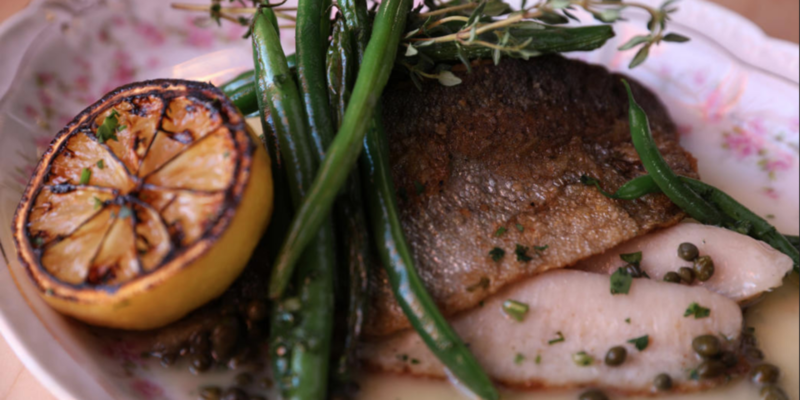 Rainbow trout is served in a classic lemon-caper sauce. 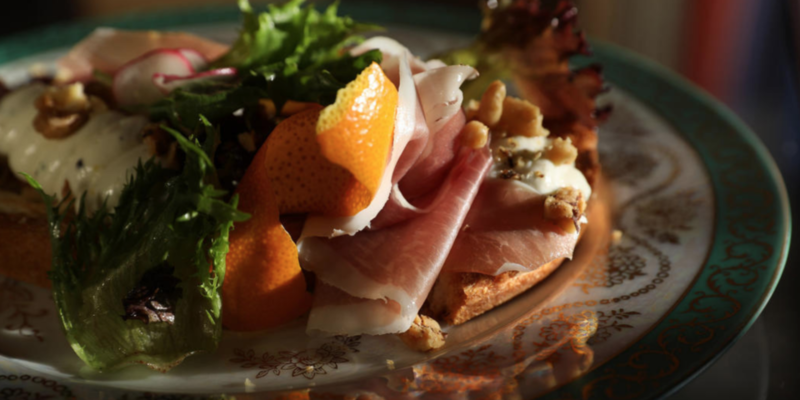 Gourmet toasts include one topped with ricotta, grape mostarda and La Quercia prosciutto. 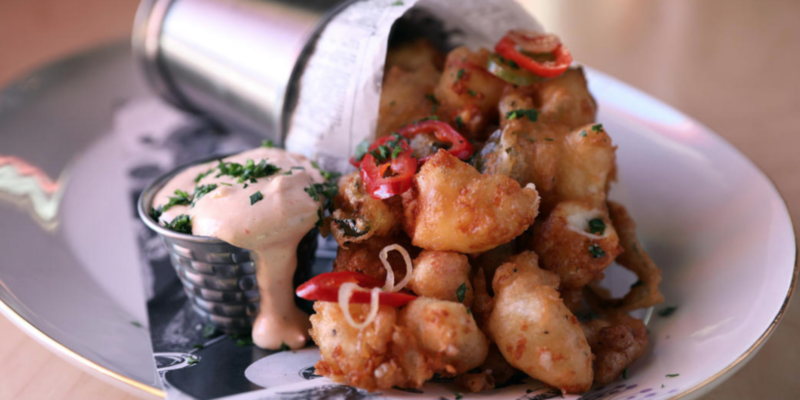 Bar snacks include fried cheese curds. 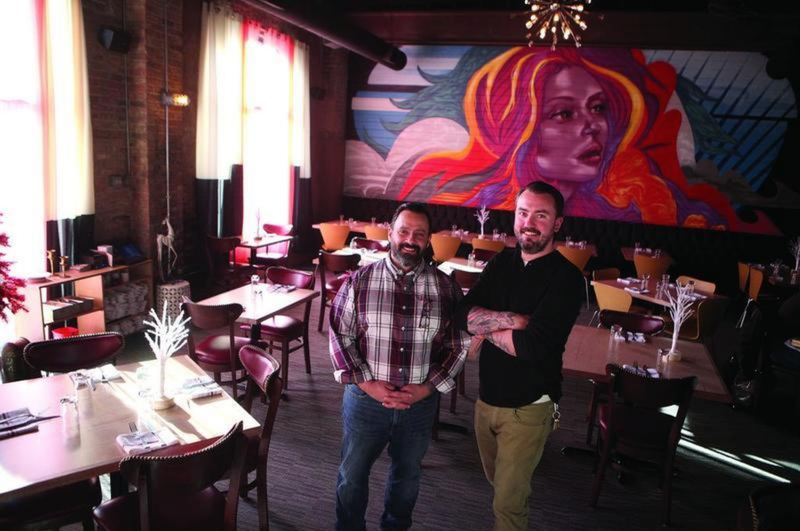 Craft Urban owner Bernie Laskowski, left, and chef Andrew Sikkelerus, saw the need for innovative restaurants in Geneva. 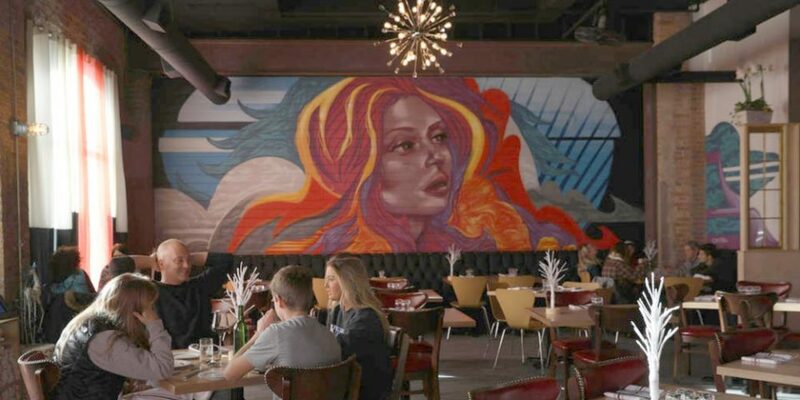 A colorful mural of Ava Grey by Caesar Perez takes up one wall of the dining room. 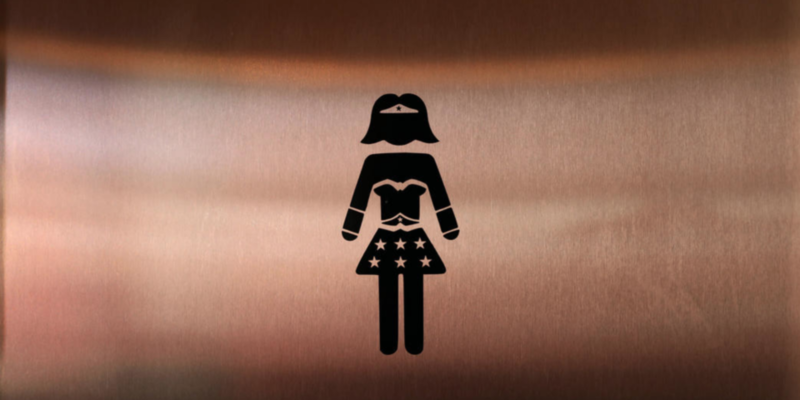 A Wonder Woman icon signals which is the women’s restroom. Super heroes decorate the women’s restroom door at Craft Urban. 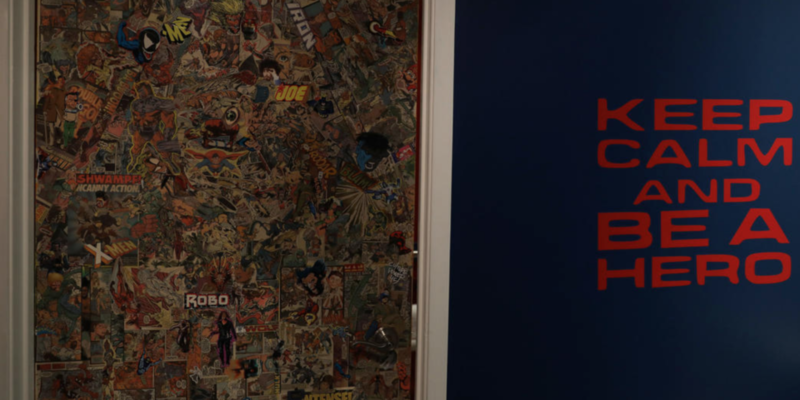 All kinds of super heroes decorate a men’s restroom door at Craft Urban restaurant. 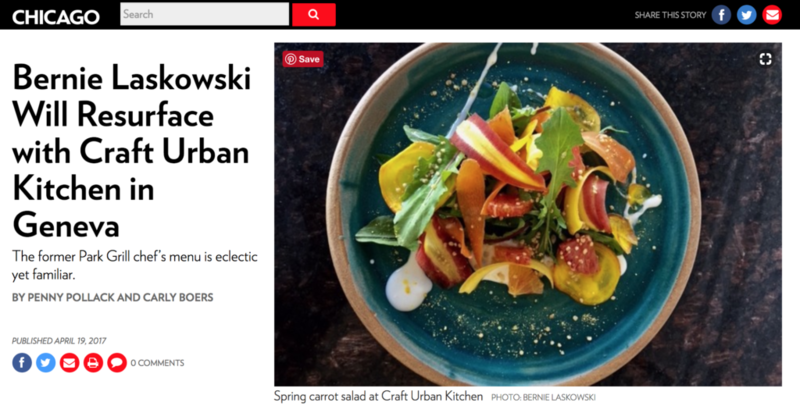 Craft Urban sounds like a whimsical name for a restaurant 44 miles west of Chicago, but owner Bernie Laskowski is quite serious about the name and its location. Laskowski certainly understands city restaurants. He began his career at Everest and later put in time at Marche and mk. He was chef for the innovative Bin 36 in its original location and later opened Park Grill, the below-The-Bean restaurant in Millennium Park. He’s no suburbanite-come-lately, having moved out west more than 15 years ago. And after leaving Park Grill in 2011, he opened a series of “shot-and-beer joints” in the south suburbs (which he later sold), and he and his wife, Cindy, created Cinderella Paleo, an upscale meal-service company based in Naperville. The economics appealed to Laskowski as well. 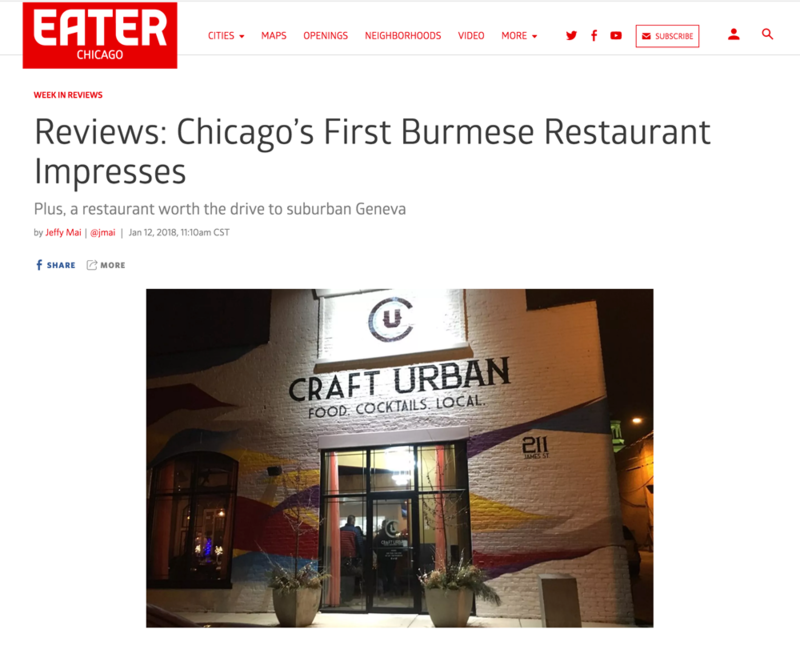 Thus was born Craft Urban, which opened in downtown Geneva in mid-November. 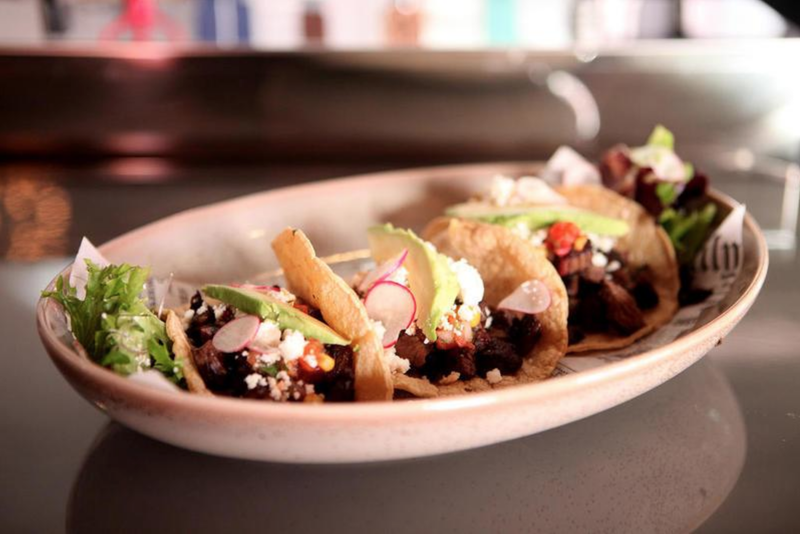 With its brick walls, stylish lighting (a couple of arty chandeliers, horizontally mounted single-bulb lights), bare-wood tables and hammered-leather chairs, the restaurant would feel at home in any city neighborhood. The front lounge offers gleaming white subway tiles and matching tufted-leather bar seats; most of the space is given to the dining room, which has carpeting (that cuts down on ambient noise, though I wouldn’t call the place quiet), and a colorful mural by Caesar Perez of Ava Grey takes up the entire west wall. 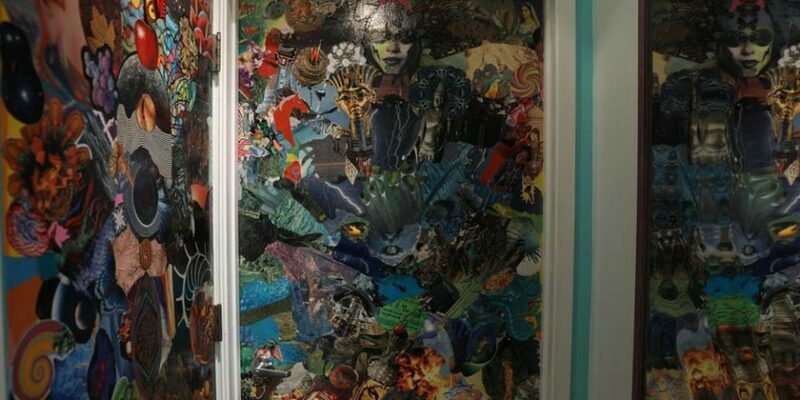 Another artist, Josh Shultz, designed the comic-book decoupaged restroom walls. The compact menu, managed adroitly by executive chef Andrew Sikkelerus, skips appetizers in favor of bar snacks and a section of “breads and spreads.” Among the former are tempura-fried cheese curds, along with bread-and-butter pickles and a mildly spiced red-pepper dip; and a Gruyere-based, gratineed fondue with crisp apple slices and brioche toast. The latter category embraces the gourmet-toast fad without using the term; there is indeed an avocado version (with sunflower and pomegranate seeds), but also a “schmear” that combines chicken-liver mousse and pork rillettes with a nice spike of mustard, a creamed-spinach and mushroom combo with aged Parmesan, and a very nice combination of ricotta, grape mostarda and La Quercia prosciutto. Sikkelerus offers a nice assortment of seafood options, bringing in wild striped bass, Rushing Waters rainbow trout, king salmon (recently added, enhanced with sesame and horseradish) and farm-raised Texas shrimp. The shrimp are the stars of the shrimp and grits, very prettily presented, and the rainbow trout, in a classic lemon-caper sauce, is one of the nicest dishes on the menu. The star of the meaty options is the porchetta, a dish created by Laskowski’s son, Sebastian. It’s basically a classy pork and beans, placing rolled pork shoulder on a bed of slow-cooked cannellini beans with tomatoes, carrots and onions, and it’s perfect winter-weather fare. Brick-roasted chicken arrives with an appealingly crisp crust and a pile of chewy fregola, a pasta shaped like little beads. Beef lovers can choose between the short ribs, sitting above sweet corn and topped with fried kale, and butcher’s beef, which consists of teres major (tender shoulder cut) sourced from Slagel Farms, arranged in wide medallions over potatoes and root vegetables. Desserts are classic indulgences. Best of the bunch is the chocolate mousse, a sort of reconsidered s’more topped with toasted marshmallow, graham-cracker crumble and sea salt. Mom’s Pound Cake, which comes from Laskowski’s mother-in-law, is thick, toasted and smothered in berries and sweet yogurt cream. Tall apple pie, and the even taller hot-fudge sundae, are exactly how you’d want these desserts to be. Friendly and unaffected service is a strength. Beverage options include close to a dozen cocktails, mostly classics (such as a well-made Old-Fashioned) and one or two clever signatures, including a tasty, boozy eggnog that I imagine won’t remain on the list very long. Wines by the glass run $9 to $12; half the wines on the 24-bottle list are less than $75. Craft Urban has a late-night ramen offering, beginning at 10 p.m. Friday and Saturday nights, augmented by half-price canned beers. Though open to all, the late-night menu functions as de facto industry nights. Another advantage to suburban dining (besides proximity and free parking) is that the wee hours arrive early. 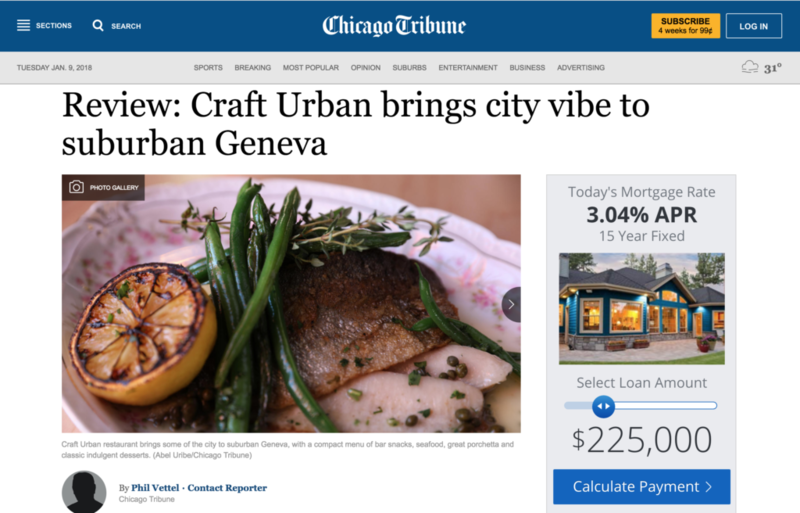 GENEVA – A partner behind Craft Urban, which opened its doors in Geneva last month, is Bernie Laskowski, who brings a high-profile Chicago restaurant resume to the local dining scene. He honed his culinary skills in Europe and Thailand, and was associated with Everest, Marché, Four Seasons and Bin 36. He launched the Park Grill at Millennium Park, where he spent eight years as executive chef. 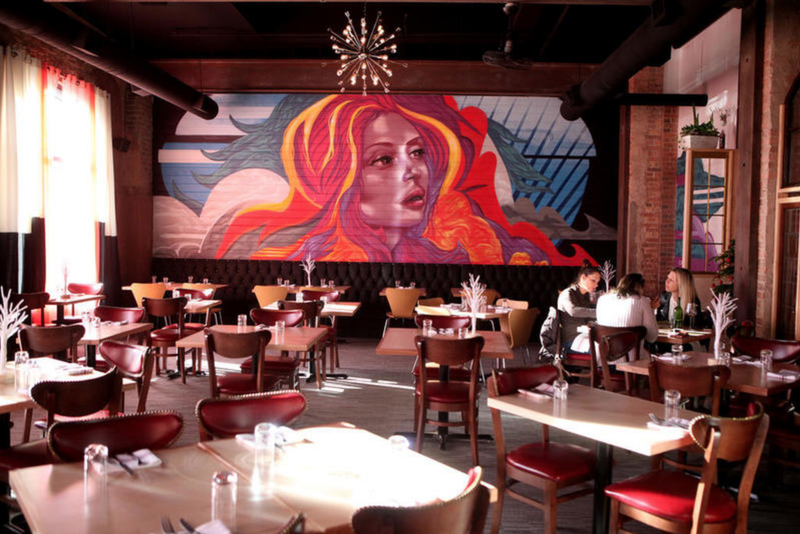 He now has crafted a much more intimate space in the former location of Nosh at 211 James St., where a muralist’s splashes of color on the whitewashed brick draw the eye to the building tucked just east of Third Street. Among the enterprises he partners in is Cinderella Paleo in Naperville, providing prepared foods and catering. 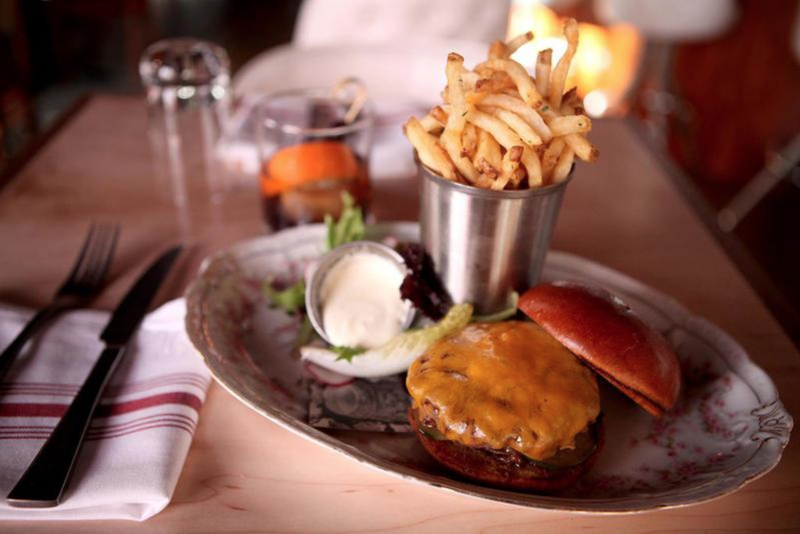 He said witnessing the blossoming of a fantastic culinary scene in the suburbs attracted his attention, and he was drawn to Geneva, which reminds him of Sonoma, Calif. 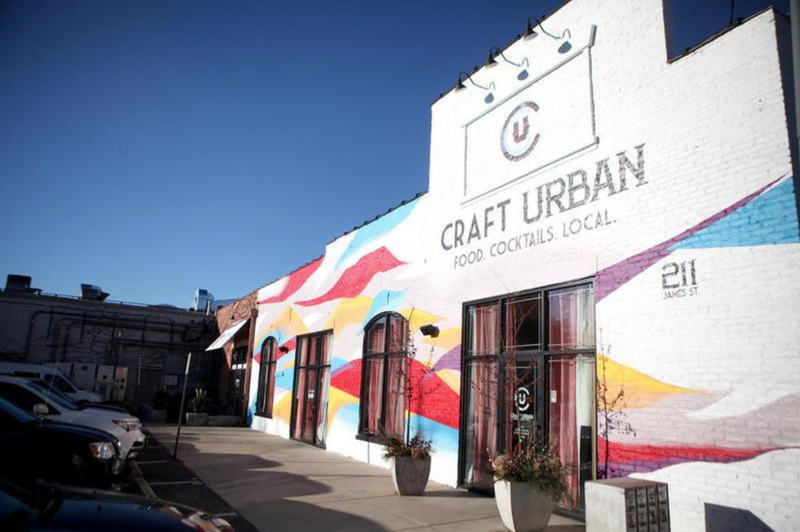 Craft Urban is about hyper-local sources of ingredients for seasonal food and drinks procured ideally within an eight-hour drive. It’s meant to be an American shared-plate experience. Among popular dishes are tempura cheese curds, bruschetta and a fondue with a crisp crunch on top and molten cheese in the center served with apples and toast points. Different smoked salmon spreads are served with pumpernickel and fresh horseradish. There’s a roast squash hummus, as well as a recipe with avocado, pomegranate seeds, Brussels sprouts and chili toast. “My other favorite is whipped ricotta on toasted artisan bread with fig … and prosciutto from Iowa,” he said. Entrees are featured, such as striped bass, beef short ribs and brick-roasted chicken. The menu also offers the Craft Urban burger, pumpkin soup and sandwiches. 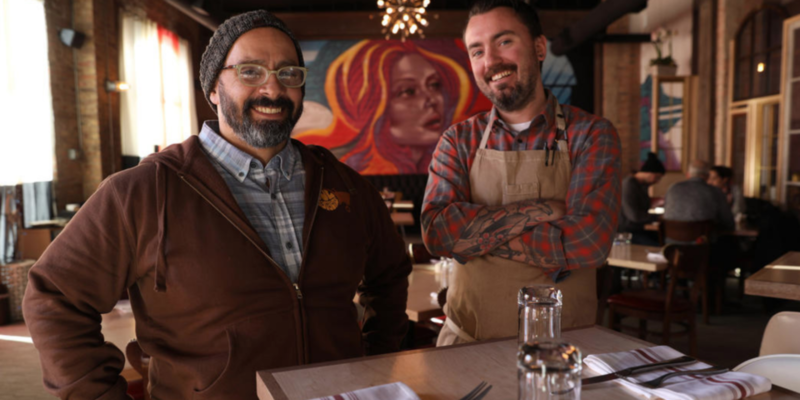 “If you’re celebrating an anniversary, the menu is designed for that, [too],” he said. Vegetables and protein receive a lighter natural touch without a lot of heavy cream and flour, he said. He curated the drink menu with an eye to not duplicating what other bars already offer in town. 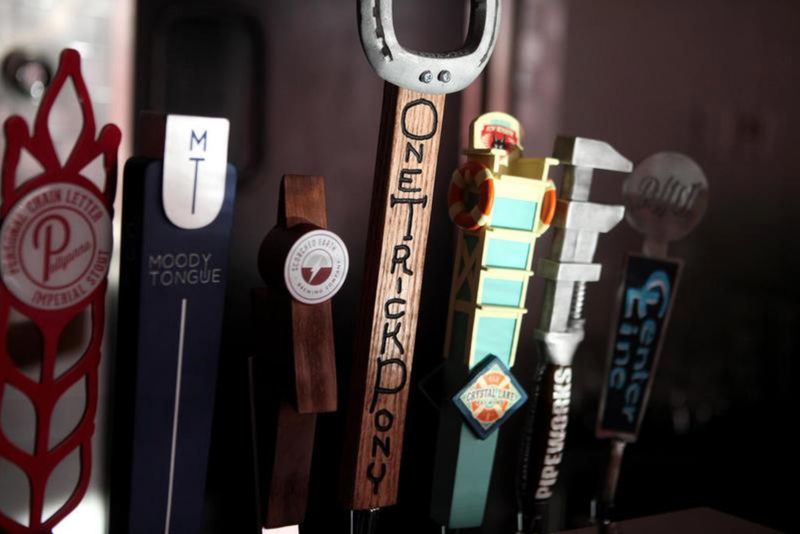 “You want to be able to support all the other businesses in the area,” Laskowski said, noting there are eight craft beers on tap that one won’t find elsewhere, along with 12 to 15 by the can and bottle, all from the Midwest area. 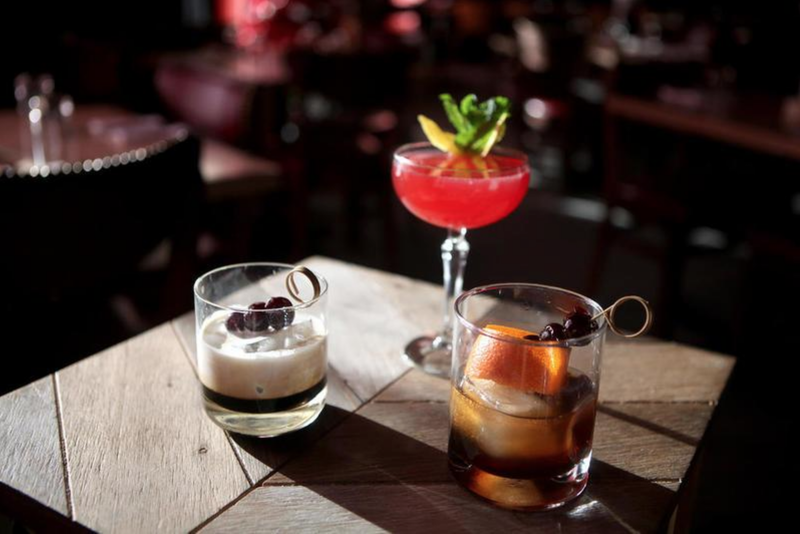 “With the cocktails, we have 10 craft cocktails that change with the seasons, the way the menu changes,” he said. About 12 wines are offered by the glass, and a bottle collection is highlighted. “A flavor profile I’m very fond of [is] very fruit forward, luscious and juicy,” Laskowski said. “I love California wines [and selections from] Washington, Oregon, Chile, Spain, France and Italy. He said they avoided picking the most expensive wines. He said he wanted Craft Urban to be a true chef-driven establishment, where the executive chef is also responsible for service. He added that the restaurant is small enough to have an open kitchen behind the bar from which the chef can oversee the dining room. The executive chef is Andrew Sikkelerus, long associated with Laskowski, whose business partner in the venture is Francisco Chavez. Because he enjoys a fresh cup of coffee, Craft Urban brings a French press to the table offering specially sourced coffee and tea. On the dessert menu is a family recipe for pound cake with tempting embellishments. Craft Urban is open from 11 a.m. to 10 p.m. Sunday through Thursday and until midnight Friday and Saturday. The regular menu ends at 10 p.m. Friday and Saturday, but Craft Urban then offers something unusual – late-night ramens. A wall-sized portrait of a woman’s face is the focal point in the dining room. Laskowski said they did a massive makeover of the space and added sound-dampening components. To learn more, visit facebook.com/pg/crafturban or call 331-248-8161. Wondering what Bernie Laskowski did following his 2011 departure from the Park Grill kitchen? “I opened a bunch of little neighborhood bars in the south suburbs. Then I sold them all,” says the chef. He also launched a prepared meal company. Next on the agenda: Craft Urban Kitchen (211 James St., Geneva), a lunch, dinner, and weekend brunch eatery slated to open August 1. On the menu: veggie-based appetizers such as smoked beets with pickled radishes, puffed quinoa, and fermented yogurt; six entrées, including handmade pasta and a burger made from a mixture of Slagel Farm beef and pork, topped with housemade pickles and tomato compote; and for dessert, pound cake with sweet yogurt and fresh berries—a recipe Laskowski and his mother-in-law have spent the past few years perfecting.